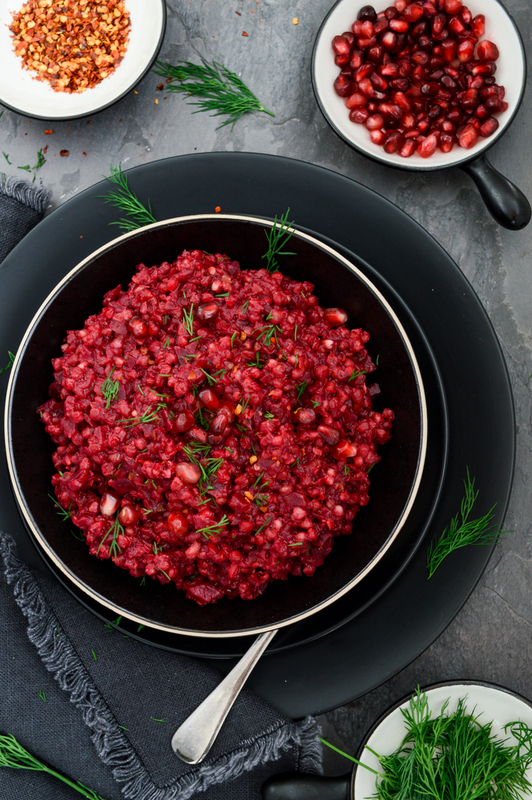 Beetroot & buckwheat risotto ala healthy style. Indulgingly creamy yet light, this is another dish from the ‘home comfort food’ series. 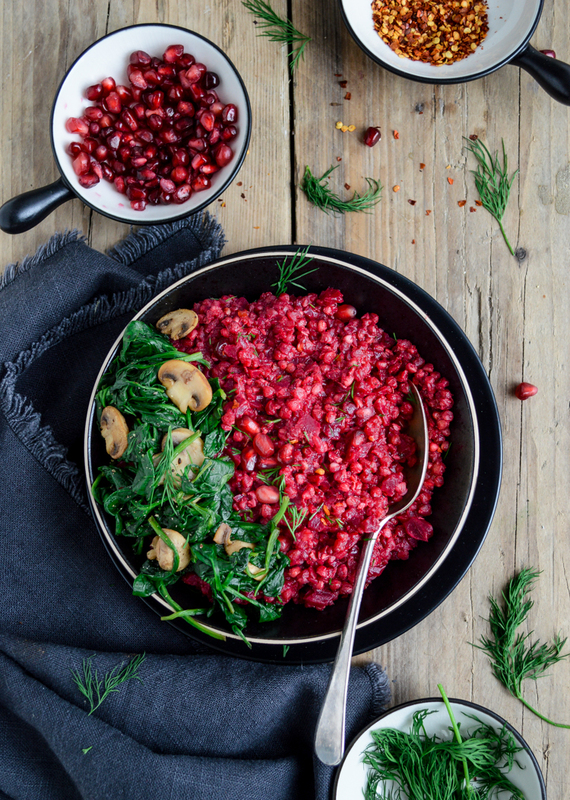 This humble meal is a true nutritional powerhouse: beetroot enriches it with iron and folate, whilst buckwheat is a great source of protein and fibre. Vegan, gluten and dairy free. If you’ve been following my humble health journey for a while, you know how much I adore beetroot. I’d already declared my love for this nutritious vegetable in my beetroot waffle post here, so I won’t ramble about it in this post. 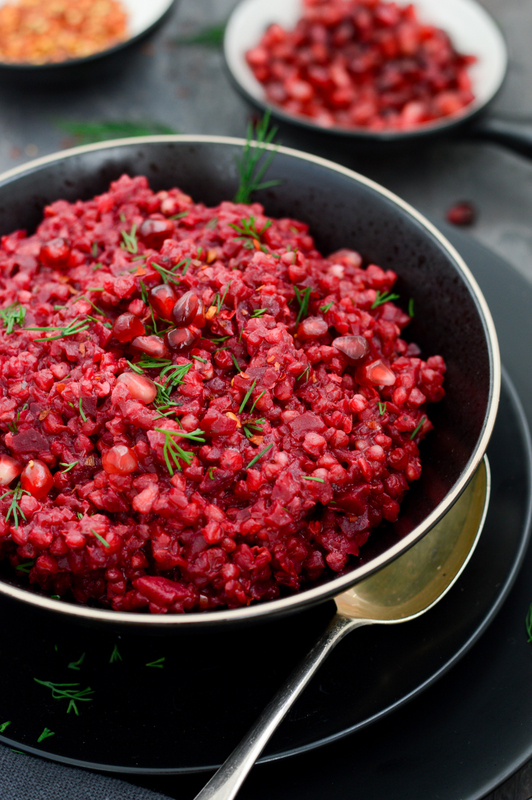 This beetroot risotto is another dish from the ‘home comfort food’ series. I’ve used light coconut milk to make it creamy yet not overly rich like a traditional risotto. I chose to serve this risotto with wilted spinach & mushrooms to add extra textures and colour, however you can safely serve it plain. I think I’ll be shortlisting this risotto for my ‘Valentine’s Dinner Recipes’. I wonder if the other half approves… I must say though, he’s been exceptionally good at making stellar curries recently, so I think I might let him spoil me on Valentine’s day. It’s lovely having your dinner cooked for you for a change, so I’ll be savouring it whilst I can. Thank you for visiting my blog. I hope you enjoy the recipe. 1. Thoroughly rinse the buckwheat. Drain and set aside. 2. Add a tablespoon of olive oil into a big pan (big enough to contain all risotto). When the oil is just starting to sizzle, add finely chopped shallot & garlic. Fry over medium heat for a couple of minutes until golden brown. 3. Turn the heat to low. Add chilli flakes, paprika, sumac, Italian herbs and bay leaves and fry for another minute. 4. In the meantime, process half of the beetroot in a food processor until fine mixture (for a minute or two). Dice the rest of the beetroot into small chunks. 5. Add the buckwheat and all the beetroot into the pan with onion and garlic. Stir well. Pour the vegetable stock, coconut milk and lemon juice into the pan. Stir again. 6. Cook on a low to medium heat until all the liquid is absorbed (around 15-20 minutes). Keep stirring every 5-7 minutes. 7. Whilst the risotto is cooking, fry the garlic with olive oil in a separate pan. When the garlic turns golden brown, add sliced mushrooms . Sautee for round 5 minutes until the mushrooms are slightly soft. Add spinach, salt & pepper to taste and cook for a further 2 minutes until all the spinach leaves wilt. 8. When the risotto is ready, add salt & pepper if needed. Serve with sautéed mushrooms & spinach and fresh dill. OMG the colors are AMAZING!! I’m not generally a beet fan but reconsidering! 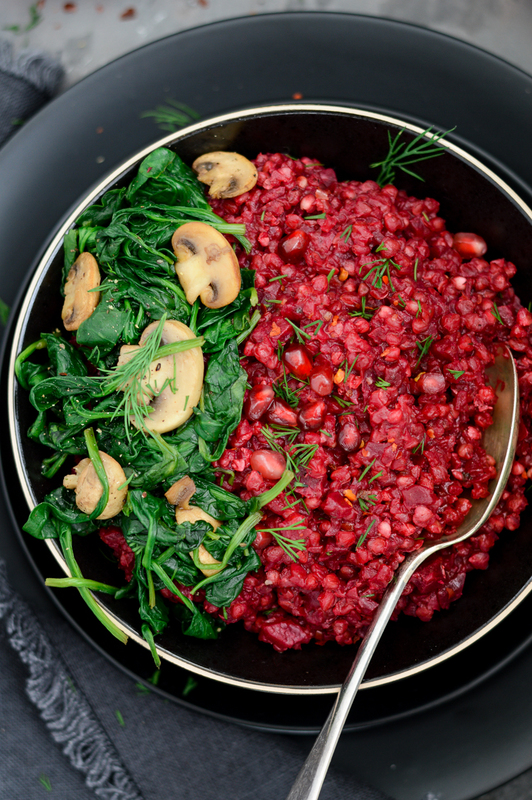 That color is amazing and I love the addition of buckwheat! All of the yums! Wow, first of all, the colors are soooo beautiful! And all of the ingredients sound perfect. I love the addition of pomegranate seeds. So good! What a gorgeous color! ANd I love that you were able to get it so creamy without dairy. Thank you Marisa. I have to praise coconut milk for a lot of my creamy creations! That is an amazing color! I’ve never used buckwheat before, what is the flavor like? Hi Lisa. 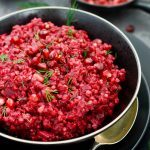 I was born and raised in Russia and buckwheat was on our menu A LOT! It has a slight nutty flavour. I love using it instead of rice or pasta (it’s a great source of fibre and protein). Really great kitchen cupboard staple. This is fantastic. The color is gorgeous and it’s healthy without tasting like it. Love it! I love anything with beets, yum! Trying this next week for sure. What a delicious dinner! I love the color, too. And your photos are beautiful! It’s such a vibrant, and wonderful recipe! 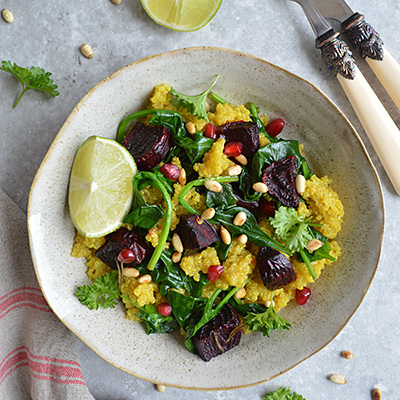 I share your love for beetroot, it’s such a tasty, healthy and powerful veggie! Plus it turns everything into this lovely pink colour! Beautiful dish Tania, pinning this for sure to try soon! This is such a pretty dish! I love the flavors. This would be a great Valentine’s Day dinner. Wow, what a gorgeous coloured dinner! I love adding a little colour and brightness to my dinner table. Going to try this one out. Thank you Mairi! I hope you enjoy this healthy & delicious meal! What a vibrant looking meal, and I am sure it tastes delicious too. Beetroots are an excellent in lowering blood pressure naturally, plus they contain plenty of nitrogen. Agreed! Perfect for Valentine’s Day. Thank you Astrid! I wouldn’t have said it better about the beets myself! This is soooo genius! The combination of the buckwheat, beets and mushrooms (some of my fav ingredients!) – I seriously cannot wait to try it! Thank you Sarah! I hope you will enjoy the recipe as much as I do. Yum Yum Yum!!! Beetroot makes such a pretty color. I love the addition of mushrooms. And buckwheat is another favorite of mine. This dish is calling my name. Thank you Jen! 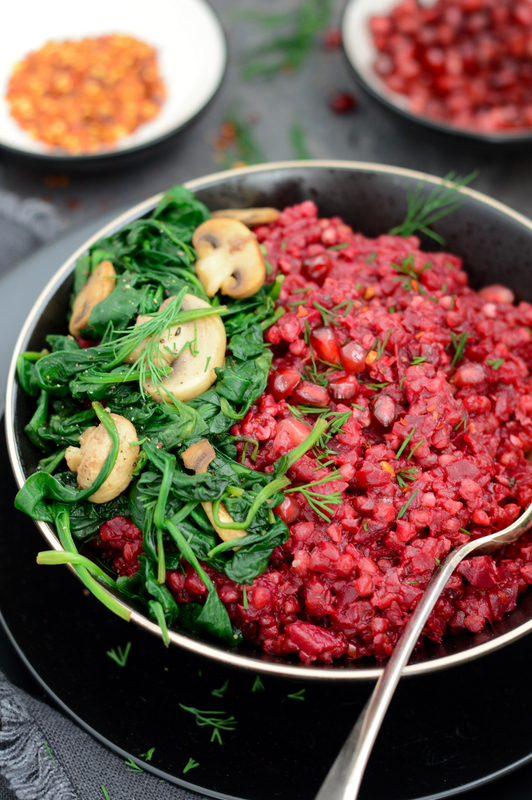 I’m totally with you on buckwheat and beetroot – it’s a great power combination, isn’t it?! Gorgeous! You’re right, this is such a great Valentine’s Day idea. 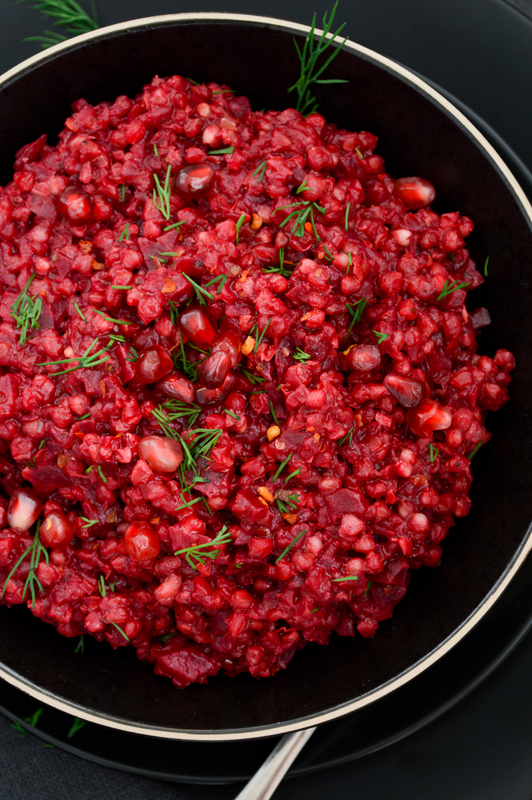 The beet is so vibrant and the buckwheat is a nice, healthy touch instead of rice. Thank you so much Leslie_Anne!